Organic. A strong tasting woody flavour spread. Made from scratch using natural, organic ingredients both locally and imported. Has tons of health benefits. Why spend time opening the tough shells of walnuts? With walnut butter you can simply spread away and ponder your own openness. Walnuts are delicious creamy nuts that are packed with Omega 3’s, and very high in Vitamin E and anti-oxidants. 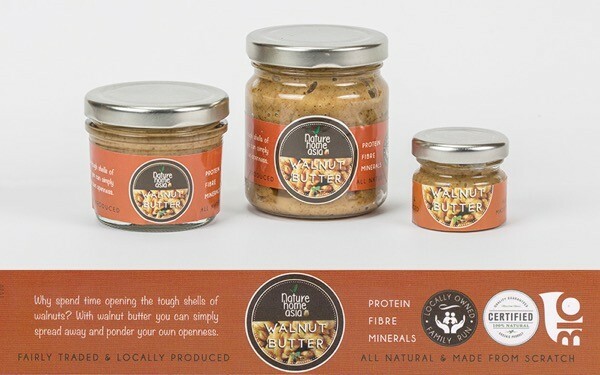 Our heavenly Organic Walnut Butter is absolutely delicious and will not disappoint. Prepare to get addicted! Walnuts are a delicious creamy nut with lots of flavour and texture. They grow in little green fruits that look like grainy textured apples on walnut trees, which are any tree from the genus Juglans. The hard shell is difficult to crack open, but inside is one of most popular nuts in the world. It is shaped like a brain, and packed with goodness which is good for both your heart and your brain! People have been cultivating and eating walnuts for roughly 9,000 years. They come from the family Juglandaceae, and have been widely consumed in Western Europe, but they are native to India and Persia. They spread through Europe and were introduced by British settlers in North America. The walnut tree can grow up to 35 meters high and has a life span that is many times longer than the average human. The best thing about walnuts is that they are one of the healthiest foods that are cultivated to be eaten. Studies promote them as a perfect dietary supplement. This is especially true because of the wide range of benefits they provide for physical health. Research shows that the benefits of walnuts are found when eaten in their whole form including the skin. We now know that approximately 90% of the phenols in walnuts are found in the skin, including key phenolic acids, tannins, and flavonoids. They are also high in calcium, magnesium and potassium. The form of vitamin E found in walnuts is quite unusual, and particularly beneficial. Instead of having most of its vitamin E present in the alpha-tocopherol form, walnuts provide an unusually high level of vitamin E in the form of gamma-tocopherol. Particularly in studies on the cardiovascular health of men, this gamma-tocopherol form of vitamin E has been found to provide significant protection from heart problems. So incredibly tasty, delicious, and so good for you. Our Organic Nut Butter is so versatile, works for savoury or sweet dishes and is the perfect protein filled Omega 3 rich snack. Did we mention it tastes out of this world? Get spreading!